Kevy Aucoin : A Beautiful Life : the Success, struggles, and Beauty Secrets of a Legendary Makeup Artist. Kevy Aucoin : A Beautiful Life : the Success, struggles, and Beauty Secrets of a Legendary Makeup Artist. Kevy Aucoin : A Beautiful Life : the Success, struggles, and Beauty Secrets of a Legendary Makeup Artist. There has never been a more influential and beloved makeup artist than Kevyn Aucoin. He was the makeup artist of choice for every major movie star, pop icon, and supermodel around, and in the process became as celebrated as his favorite personalities. His life was a dizzying mix of fame and glamour: Presidents and princesses knew his name, and his work appeared on countless catwalks, red carpets, and magazine covers. But Kevyn's mission wasn't to make the beautiful people even more alluring. Inspired by his difficult childhood in a homophobic Southern town, he chose to see beauty everywhere -- in all faces, races, and sexualities. For Kevyn, who struggled his entire life with feelings of inadequacy, inner beauty was as important as the physical beauty that surrounded him. "Kevyn Aucoin: a beautiful life" chronicles the magical journey of this makeup guru as seen through the eyes of his family, friends, lovers, and fashion-industry insiders. It traces his beginnings in a Louisiana orphanage, where his unmarried sixteen-year-old mother placed him for adoption, to the mysterious illness that tragically ended his life at the age of forty. Here, Gwyneth Paltrow, Julia Roberts, Janet Jackson, Barbra Streisand, Britney Spears, Tina Turner, Cindy Crawford, Naomi Campbell, Hilary Swank, Christy Turlington, Isabella Rossellini, and dozens of other luminaries reveal in exclusive interviews what made Kevyn so talented, funny, fiercely loyal, and ultimately irreplaceable. Also included is the first-ever compilation of the makeup techniques that made Kevyn so legendary, accompanied by easy-to-follow step-by-step photos. He refined these signature tricks throughout his career and reliedupon them to turn the most celebrated beauties into something extraordinary. 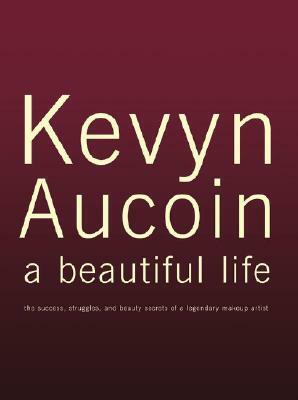 Title: Kevy Aucoin : A Beautiful Life : the Success, struggles, and Beauty Secrets of a Legendary Makeup Artist. Description: A beautifully produced book which "chronicles the magical journey of this makeup guru as seen through the eyes of his family, friends, lovers, and fashion industry insiders." Unmarked and in "gift quality" condition with handsome burgundy coloured 'metallic' dust jacket.